With the Dustin Lamp, black and white color blocking intersects with the faceted, sharp angles trend. The black and white marble segments are broken up by three antique brass bands. A new, cool classic that draws inspiration from Art Deco. Topped with a rectangular, ivory microfiber shade lined in white. 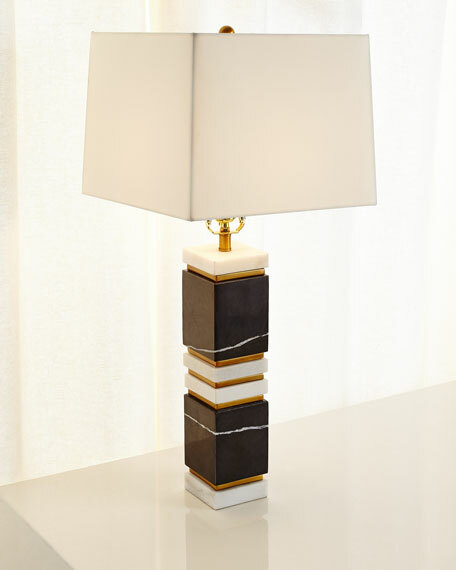 Lamp crafted of marble and brass. Due to the natural state of the material, marble veining will vary. For in-store inquiries, use sku #2346386.